In the same way it took until my mid thirties to discover I was an artist, it has taken until maturity to recognize the deep worth in my family stories, my genetic predispositions, my cellular relationship to the “long ago” know times of the planet. I have, however, always been interested in the stories the earth has to tell and the native populations who understood from the beginning that all life forms are intertwined. I began my “art story” in clay and theater, but as soon as I discovered the three dimensional surface, I never looked back. After graduating from The Evergreen State College in Olympia, WA in 1981, my children went to live with their father for several years and I headed to Seattle where I entered a very active and exciting art community. Under the guidance of Seattle painter, Karen Guzak, with whom I studied privately for two years, I developed my own art “language”. I showed my work in multiple venues from studio hallways to juried museum exhibits to solo exhibitions, and won multiple painting awards (see resume). As Artist-in-Residence for WA State, I taught classes in the WA state prisons. I have been strongly influenced by the natural world. I see there the interrelationship of and cyclical influences inherent in all beings; plant, animal and human. In describing these interests through my images I often use a spherical sun/moon and repetitions of symbols, creating a musical flow in the rhythms both seen and implied. In 1979 I took my first trip to the American Southwest. 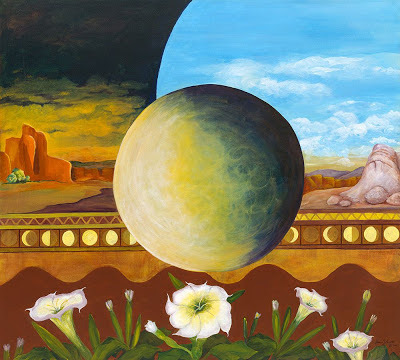 Before, during and ever since that trip I have found in the ways of the Navajo, Hopi and Pueblo cultures reference to the same rhythms and spiritual interconnectedness that is such a strong basis for my beliefs and my artwork. The next journey was to South America, where there is a strongly similar mix of native and Spanish culture. The art forms, the building materials, the sky and light, the nature of ceremony made physical for me the life of spirit. My way of making images was solidified. My eventual and inevitable move to the Southwest coincided with a painting fellowship at the Helene Wurlitzer Foundation in Taos, NM. My work with the Creation/Migration Collaboration is inclusive of a lifetime of images and philosophies tied into a meaningful artistic relationship. Information gathered from the DNA genographic study has opened new worlds of thought and stimulated interest in my own genealogical information. The artwork that has come from and continues to build on this project is biographical in nature to include remembrances of family events that have worked their way into myth and tie into other mythological stories of the people along my ancient migration route all the way back to the Mitochondrial Eve in Ethiopia. It enhances my belief in the interrelationship of all peoples. I am finding and using photographs and artifacts from my family histories and expanding these to include the stories of others. For example, the “Fruits of Her Labor” piece utilizes photographs from my own matrilineal line, items from my own life experience, imagery typical of my style, in the format of traditional women’s work, all wrapped in the idea of reproduction. This is a nearly direct representation, but my paintings, while more symbolic in nature, still tie together my own story to that of the larger world. Symbolic of "birthing" my imagery onto the New Mexico landscape, incorporation light/dark. moon cycles, celestial and earthly, and the far and the near. The amorphousness of the spirit/god nature balances the physicality of the DNA helix and cellular structure of matrix. All combine in the rhythm of life.